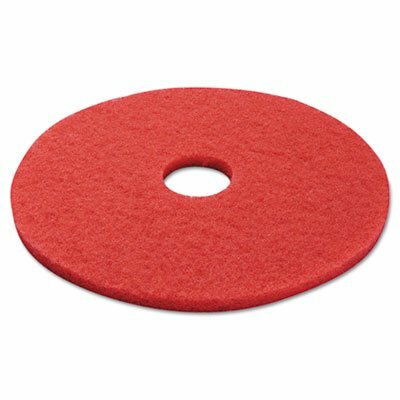 3M Scotch-Brite Heat-resistant pad designed for use with the Scotch-Brite quick clean griddle cleaning system to clean flat top griddles. Cleans griddles faster than traditional griddle polishing pads. Thick, open construction allows for easy rinsing, providing multiple uses. The pad is an integral part of the Scotch-Brite quick clean griddle cleaning system. 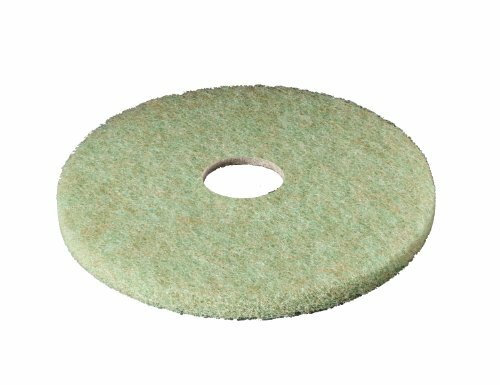 Abrasive mineral particles evenly distributed throughout the pad to help ensure effective, consistent, and long lasting performance throughout the life of the pad. High quality bonding r esin system designed to provide resistance to degradation from exposure to hot water, detergents and normal cleaning liquids. 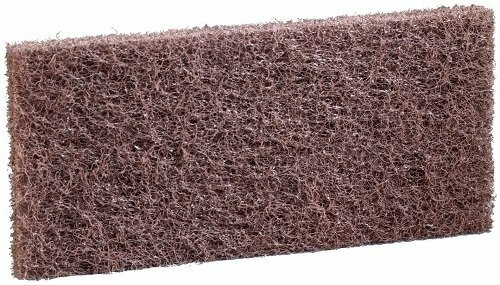 Aggressive, heavy duty and open pad construction to provide fast cleaning and multiple uses, resist clogging, and rinse clean easily. 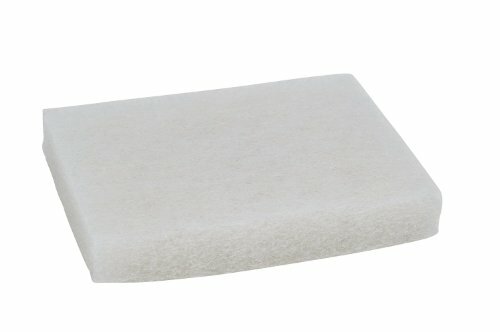 Heat resistant pad to allow for cleaning griddle at operating temperature throughout the day. Applications: Use for cleaning, scouring, and polishing griddle surface. Measures 5-1/4-inches length by 4-inches width by 0.8-inches thickness. Orange color. Do not use on polished or easily scratched surfaces. 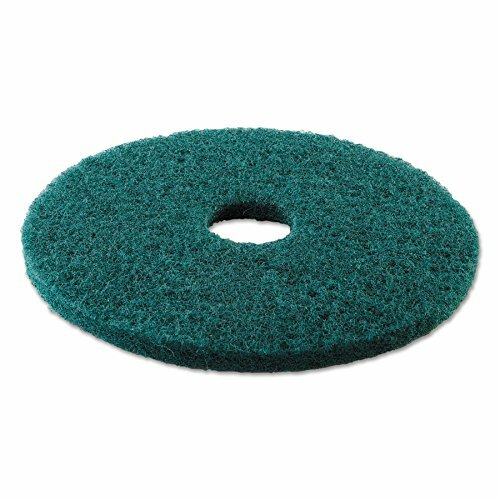 Brand: 3M | Manufacturer: 3m Co.
REDUCES SCRATCHING - finer abrasive grit to diminish scratching so using Powerhouse pumice stone for toilet cleaning works well. CLEANS SURFACES QUICKLY AND EASILY - cleans porcelain fixtures, hard-water stains, pool tile, toilet bowls, barbeques, steel and stone these even work for feet! Designed for tough jobs like removing finish and wax buildup from baseboards and floor edges. A great way to strip stairs. 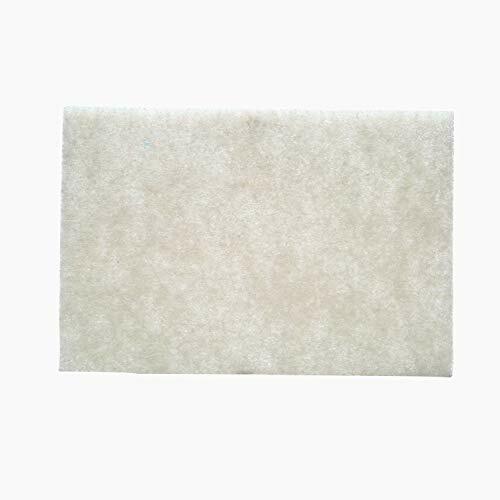 Fits 3M Doodlebug Pad Holder 6472 or 3M Doodlebug Handblock Pad Holder 6473. Disposable Scrub Singles provide powerful kitchen cleaning without the hassle. 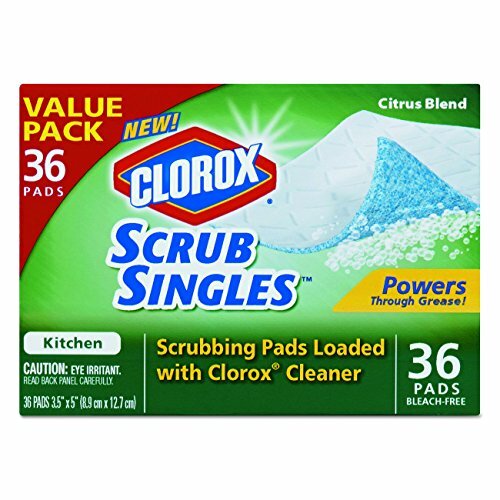 Preloaded with Clorox Cleaner, these strong, flexible, bleach-free scrubbers cut through grease and grime on kitchen surfaces, such as stovetops, sinks, faucets and countertops. Easy to use: simply wet, scrub, toss and you're done. Leaves your surfaces sparkling with an invigorating citrus scent. 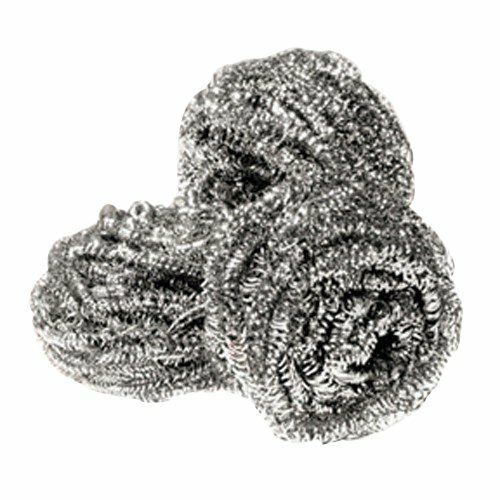 The Scotch-Brite stainless steel scrubber is stainless steel scrubber balls wound together using a single coiled stainless steel wire strand. 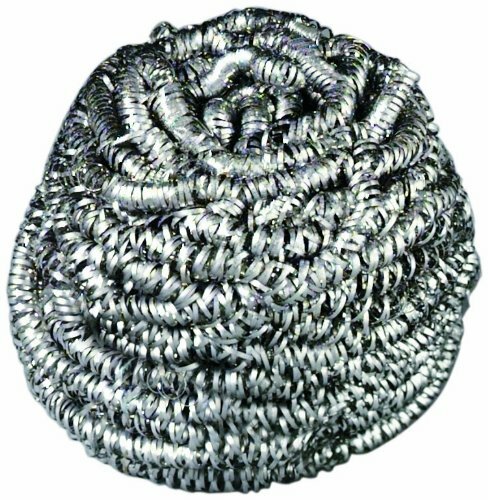 The wire strand is made from high quality AISI 400 series stainless steel. The scrubbers are designed for tough kitchen cleaning jobs. Single wire strand construction to eliminate multiple ends. High quality grade stainless steel to withstand breakage under normal usage and provide durability and corrosion resistance from exposure to hot water, detergents and normal cleaning liquids. Applications: Use for cleaning, scouring, and scrubbing pots, pans, baking dishes, broiler pans, grills and ovens. Excellent performance in removing baked-on food from cookware. Scours up to four times faster than conventional commercial scouring products. 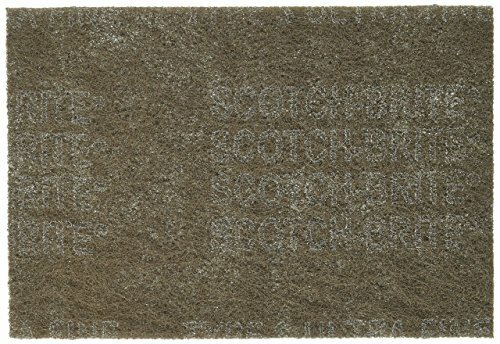 Up to eight times less abrasive than other medium/heavy-duty commercial scouring products to reduce scratching. Unique bow-tie shape. Applications: kitchen: ideal for cleaning stainless steel surfaces and appliances, for cleaning and removing heavily baked-on food soil from pots and pans with minimal scratching. Also used to maintain cooking appliances, coolers, ceramic tile, countertops, and maintenance equipment Bathrooms: For cleaning sinks, faucets, porcelain and ceramic, general: elevator doors, doors, kick plates, desktops, floors, walls, drinking fountains, lockers, ceramic tile, and glass. Measures 5-1/2" length by 3-57/64" width. Brand: 3M | Manufacturer: 3M/COMMERCIAL TAPE DIV. 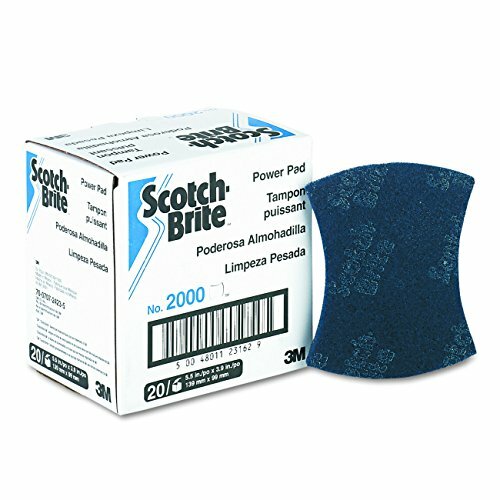 Scotch-Brite(TM) light cleansing hand pad has fine mineral for very light cleaning. 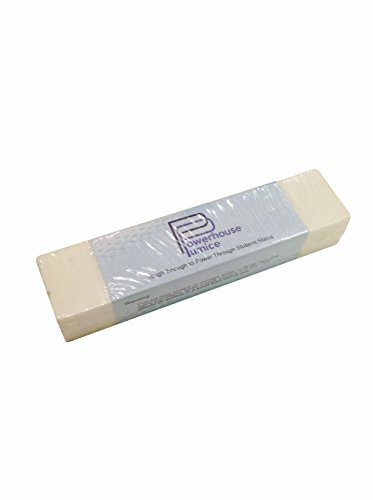 Use with liquid detergents for wax mold deflashing, highlighting and top coat rubbing of wood, cleaning of porcelain, stainless steel, chrome, painted surfaces and glass. Measures 9-inches length by 6-inches width. 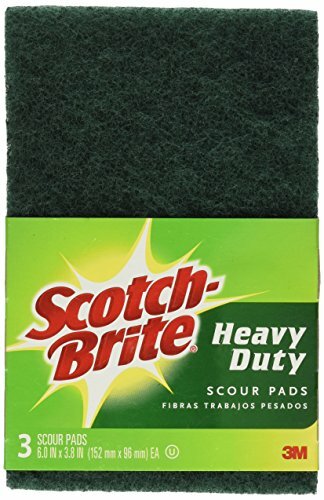 The Scotch-Brite light duty scrubbing pad is a convenient, thick, hand-sized pad designed for gentle, no-scratch cleaning of the most delicate surfaces. Made of synthetic fiber. Typical applications: glass, plastic, fine china, porcelain, ceramic, non-stick surfaces and glass cookware. White color. Measures 5" length by 3-1/2" width. High quality stainless steel for tough cleaning chores won t rust or splinter. Removes baked-on food from pots, pans, baking dishes, grills and ovens. Two sizes. 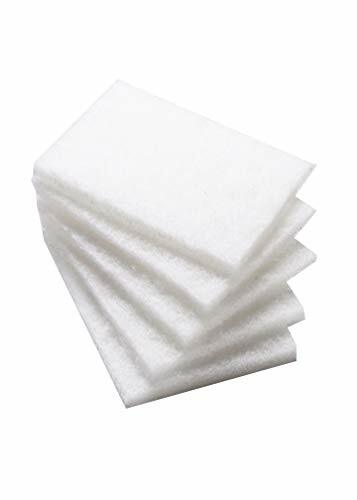 This value pack contains two of our Nylon Net Cleaning Pads and two of our Nylon Net and 100-Percent Terry Cleaning Pads. 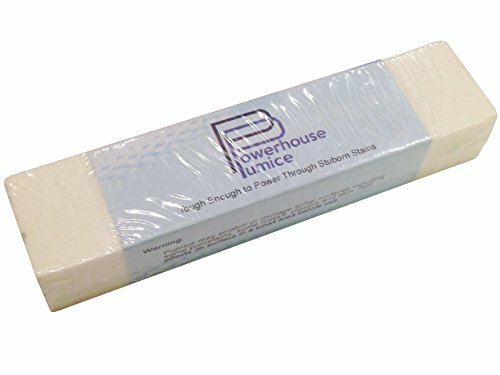 These pads won't scratch most surfaces. Use them everywhere in your home. 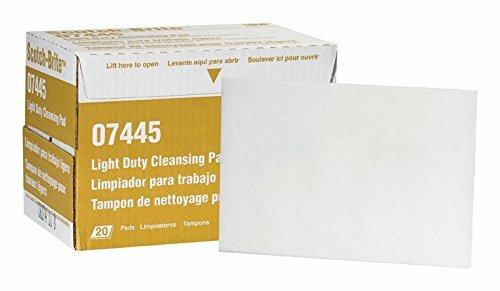 Be sure to rinse each pad after use, 24 pack (6 packs of 4). For light scrubbing of floors with autoscrubber prior to burnishing. 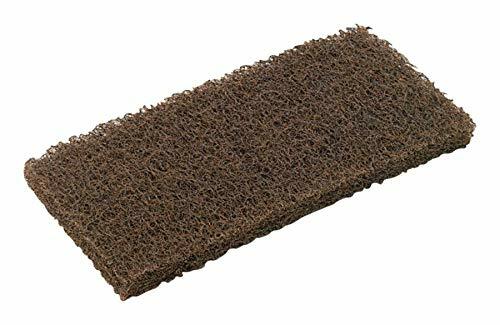 Excellent daily cleaning pad, minimal finish removal. Open construction resists clogging and allows for easy cleaning. 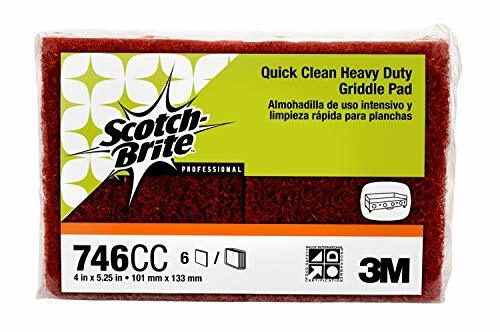 Scotch-Brite, 6' x 9', White Light Duty Cleaning Pad, Soft, Non-Woven Fibers & Mild Abrasive, Gently Cleans Most Surfaces, Typical Application: Stainless Steel, Chrome, Copper, Porcelain, Ceramic.